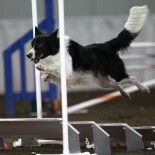 This blog is the home of dog agility bloggers around the world who join together several times a year to write on interesting and helpful topics for dog agility enthusiasts. Once a year we hold a Dog Agility Action Day where we join together to raise awareness of an issue and try to improve our sport. If you are a dog agility blogger please join the Dog Agility Blog Action Day email group and take a look in the archives for more details.